AMTECH JACKETTEDBallvalves offer all the proven design attributes of standard 2-way valves and are available in a wide range of different jacket connections. Am Tech jacketed valves are especially used for media that might crystallize or seize and therefore must be influenced through additional heating or cooling. The welded jackets consisting of two shells reach from flange to flange and assure consistent valve heating or cooling of the process media to prevent crystallization or seizing of flow media. This applies especially to media like bitumen, liquid sulfur, resins, etc. In addition, the efficient flow of media is ensured through the elimination of pockets. Oil, steam, water, brine can be used as carrier for heating or cooling media. The special valve design allows the hydrostatic and pneumatic examination of the valve body prior to the jacket welding process. Following our quality assurance rules, every valve is tested again after the jackets have been welded to the body. 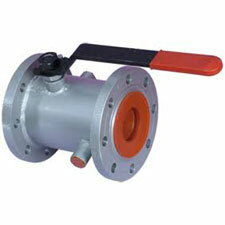 Am Tech jacketed valves can be supplied as 2-way or 3-way versions with flanged ends. Screwed or weld ends are available upon request as well. We manufacture valves from genuine guaranteed raw material with material test certificate , hydraulic test certificates , Mill TC 3.1.b available with all supply. Also , we can provide valves with third party inspection agencies.